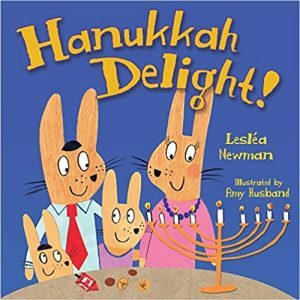 A family of bunnies, along with an owl, an alligator, and other animal friends, celebrate Hanukkah in this rhyming board book that includes the beloved rituals of the holiday. I love Hanukkah! I love lighting the candles, spinning the dreidel, frying latkes, eating chocolate gelt, singing songs, and exchanging presents. So I decided to write a book for very young children that celebrates all the joy of the Festival of Lights. You are here: LesleaKids.com > Books for Kids & Teens > Picture Books > Hanukkah Delight!